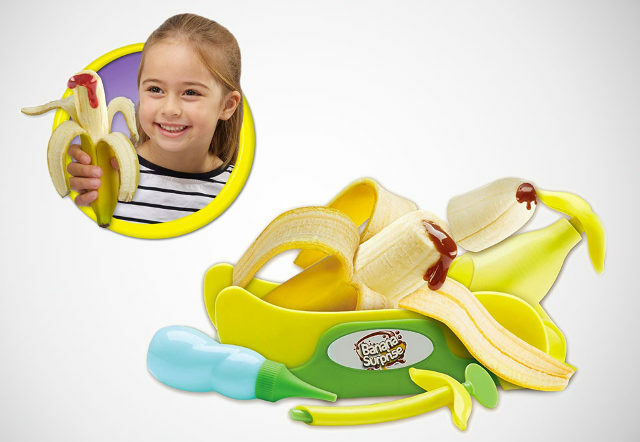 So, this is how the $27 "Banana Surprise" works. You cut off the tip, just the tip. Then, you rest the fruit in the "Yumstation." Now, this is where the fun begins. You get out the tool and jam it into the end and then quickly pull out. And now, according to the directions, it's time to fill that hole with some sweet syrup, fruit puree, or cream. It's just a banana. It's just a banana. It's just a banana.